Using the global symbol of love, romance and togetherness, heart shaped engagement rings have been a popular choice for many years. What makes this design so appealing is its versatility. 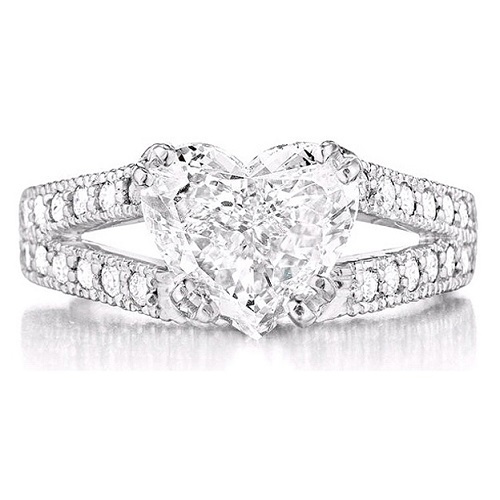 While heart shaped diamonds are frequently featured in this style, there are many other ways to bring in this symbol aside from the stone. 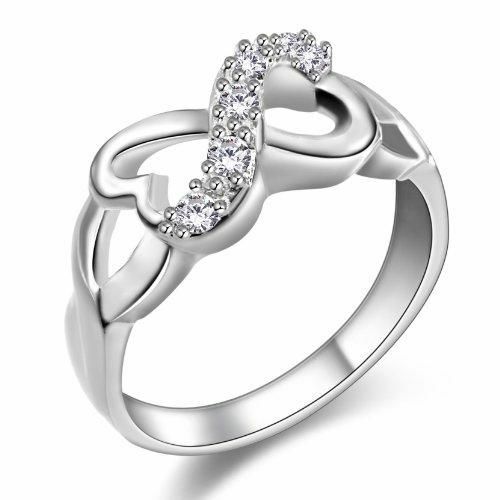 Intricate detail on the band, engraved motifs, joined hearts, multiple hearts and even clever infinity heart designs help to make this ring romantic and special. The classic heart shaped ring features a simple band, with a single solitaire design that puts the heart stone in centre focus. What makes this design so timeless is that it is unadorned, simple and elegant, with no other stones or elements added to overshadow the centre stone. If you have classic tastes, this style is always a winner. For a bolder design, mixing stones and metals gives the ring a unique, quirky look. Adding extra detail in the form of pave, twisted bands and unusual metal and stone pairings will up the boldness of this design. 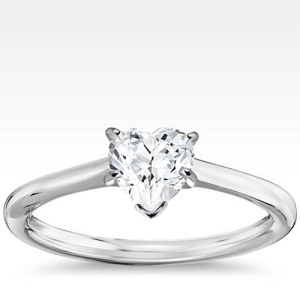 This style works well in as a three stone diamond engagement ring, with a slightly large stone at the centre that is flanked by two smaller stones. This ring turns the heart into part of the band, for a minimal look that is modern and beautiful without being over the top. 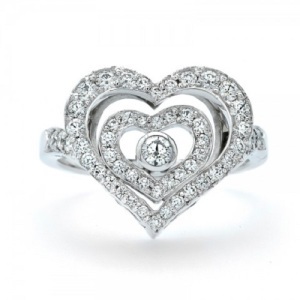 Three stones encrusted within the heart add symbolism and detail without overpowering the simple design. This style works well in platinum as well as rose gold, white gold and yellow gold. Splint band rings have remained a classic choice through the eras, and, with pave encrusted bands that feature a heart shaped diamond at the centre, this look is especially romantic. This ring has plenty of sparkle, which works well on cool toned metals. On warmer metals, the result is more dramatic, but equally gorgeous. Who says you have to limit yourself to just one heart? 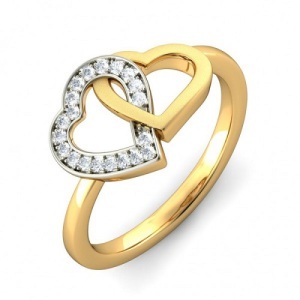 The heart within a heart design has plenty of symbolism, signifying the never-ending love between you and your partner. With a single diamond at the centre, this trio can also represent the past, present and future of your love. This contemporary design fuses an infinity sign with hearts, in an undeniably romantic ring that is also modern and surprisingly simple in its adornment. To ensure that the focus stays on the infinity heart, it’s best to keep stones simple and small. 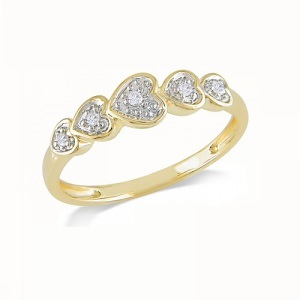 A pave band could also work well, leaving the centre hearts bare. A pretty, simple and timeless ring, this style features a simple, fine band, with five heart diamonds in a row. The centre stone is slightly larger, and is offset by four smaller stones. This ring will never go out of style. Gold works well with this design, but cooler metals and rose gold would be equally lovely. 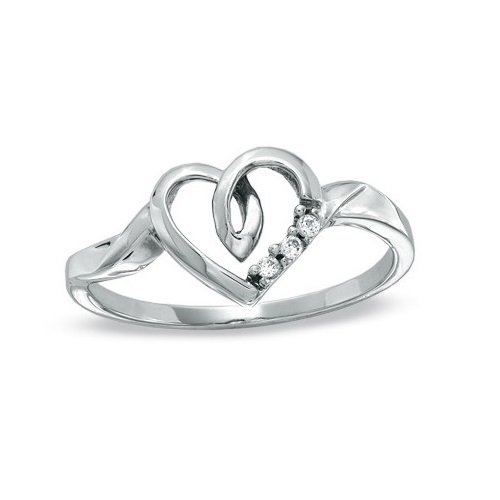 Linking the hearts is undeniably romantic. The two hearts can be kept simple or encrusted with stones, or a mixture of both, like this example. Plain hearts can be balanced with a pave band, or pave hearts can be balanced with a plain band. This style works well in any metal, but could also be varied by choosing coloured diamonds or precious stones instead of classic white diamonds. Have an amazing idea for your dream engagement ring? Send us your design and we will help you turn that dream into a reality. Amid all the glamour and romance and excitement, it is not always as fun to think about the less glam side of engagement rings… such as insurance appraisals. But, like it or not, owning any valuable item means protecting it carefully against any and all risks. Appraisals are the simplest and most effective ways to get an accurate value of your precious new ring, so that it can be properly and fully insured. In this mini-guide, we take a look at the process of appraising diamond engagement rings so that you know exactly how it works. #1 What is an appraisal? Simply put, it is a document that verifies details about your ring, granted by the jeweller who made your ring or one who is able to assess the ring. It is not quite the same as a diamond certificate, but incorporates the stone (size, value, weight and authenticity) as well as the metal (grade, quality, authenticity). This report will give you the exact details of your ring, right down to the last stone. #2 Why get an appraisal? You will need one if you get your ring insured (whether in its own right or under your household insurance). While no one likes to think of anything bad happening to such a precious item, there is always a potential risk of it being lost, stolen or damaged. You may want to have it replaced (either for insurance replacements or for repairs), and in that case, an appraisal will help you repair the ring so that it almost identical to the original. If your ring is stolen and recovered, it will also serve as proof when presented with your police report. #3 Where do I get the ring appraised? Not all jewellers are able to do appraisals, but many are qualified in this field. Speak to your jeweller to find out what they would advise. Gem specialists can also assist (provided that they are qualified and specialised in gem appraisal). Always be sure that your appraiser has the credentials to perform an accurate appraisal. This will ensure that he or she follows best practices and adheres to professional and ethical standards. #4 When do I need to get one? You can get your ring appraised from the very moment you receive it. It’s best to get it done early just in case anything should happen to it. It will also give you one less thing to worry about once wedding planning begins. Bring up the topic with your loved one to explain the purposes though – you would not want any hurt feelings to come from your beloved thinking you are doubting the ring’s authenticity! #5 How does it work? One way to go about the process is to ask for a plot diagram that shows the stone’s measurements and internal characteristics. Some appraisals can be done in front of you. Many have a special sheet used to keep track of appraisals. If you are unsure, speak to a jeweller that you trust to ask what you can expect from the process. Price wise, you should budget for an appraisal rate that is often hourly. 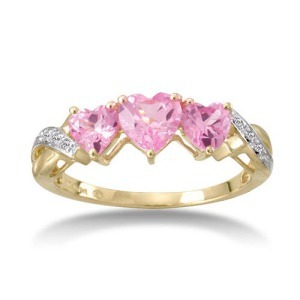 It is worth every cent however, as you will then have a record of your precious ring’s details. This will go a long way in helping to ensure that your engagement ring can be fully protected and insured.